Context - Land is an essential resource for human survival, and yet it is being degraded sometimes to the desert state through unsustainable uses. Land is essential for producing most of the food that the world’s ever growing population needs, and yet its contribution to our quality of life is perceived and valued in starkly different and often incompatible ways. While land degradation is a global problem, it takes place locally and requires local solutions. Greater commitment and more effective cooperation at the local level are necessary to stop this degradation and loss of their biodiversity. Now more in-depth analysis of the multiple functions of the land are emerging viewed from a wide range of interrelated sectors and thematic areas. This includes the food-water-land interactions, as well as less obvious drivers of land use, notably the type of economic growth, consumer choices and global trade patterns. 2. What is meant by land desertification? The United Nations Convention to Combat Desertification (UNCCD) defined desertification in its 1995 declaration as "land degradation in dryland areas due to various factors, including climatic variations and/or human activity". The term is often linked to images of deserts moving across landscapes, encroaching on farmlands, and starving vulnerable populations. However, desertification is only one part of the wider problem of land degradation, and so the 2018 World Atlas of desertification uses a more inclusive definition: "land degradation leads to a long-term failure to balance demand for and supply of ecosystem goods and services". The present pressures on global land resources are greater than at any other time in human history. A rapidly increasing population, coupled with rising levels of consumption, is placing ever-larger demands on our land-based natural capital. A significant proportion of managed and natural ecosystems are degrading, which is especially alarming in the face of the increased demand for land-intensive crops and livestock. This biodiversity loss but also climate changes further jeopardize the health and productivity of land: higher carbon emissions and temperatures, changing rainfall patterns, soil erosion, species loss and increased water scarcity. The combination of these factors alter the suitability of vast regions for food production but also human habitation. Land degradation decreases resilience or resistance to various other types of stresses; it increases vulnerability, especially of the poor, women and children, can intensify competition for scarce natural resources, and results in migrations, political instability, and conflicts. The scale of resulting rural transformations in recent decades has been unprecedented: millions of people have abandoned their ancestral lands and migrated to urban areas, often impoverishing their cultural identity, abandoning their traditional knowledge, and permanently altering landscapes. 4. How can land be used (more) sustainably and what is missing until now to decrease desertification? 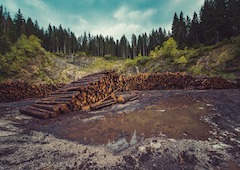 Whether people act as consumers, producers, corporations, or governments, it is the sum of all individual decisions that is fueling a global land crisis, and the "business-as-usual" approaches are insufficient to address the magnitude of these challenges. In answer to that situation, the Sustainable Land Management (SLM)², a holistic approach was developed to preserve all services in long-term productive ecosystems. The SLM is defined as "the use of land resources, including soils, water, animals and plants, for the production of goods to meet changing human needs, while simultaneously ensuring the long term productive potential of these resources and the maintenance of their environmental functions". This approach is integrating economic, sociocultural and biophysical needs and values. The SLM forms now one of the main mechanisms to achieve Land Degradation Neutrality, a point where this degradation by human activity is counterbalanced by actions to increase gains. Indeed, scientific evidence increasingly highlights the advantages of adopting practices such as land-based solutions that have the potential to simultaneously address Desertification, Land Degradation and Drought (DLDD), climate change adaptation and mitigation, as well as often achieving other co-benefits, such as protection of biodiversity. Climate action (SDG 13), by increased carbon stocks in biomass and soil. 5. What is missing to reach Land Degradation Neutrality (LDN)? Projects tackling sustainable development issues have long suffered from fragmentation, compromising the implementation of comprehensive and effective solutions4. What is usually missing are really holistic transformative projects and programmes integrating the various dimensions of the issues. The failure to develop such large-scale transformative projects equals huge missed opportunities to achieve sustainable development. 6. What is the World Atlas of Desertification and what are its main findings? The World Atlas of Desertification is a document of the European Commission which focuses on the underlying causes of land degradation worldwide and global environmental change, highlighting in particular the urgency to adopt corrective measures. It offers on this basis to policy and decision-makers worldwide, a tool for comprehensive and easily accessible insights into land degradation and its causes. These insights can be used to identify important biophysical and socio-economic processes that, on their own or combined, lead to unsustainable land use and land degradation. This provides ways to improve local responses to soil loss and land degradation, all measures and potential remedies to tackle desertification and restoring degraded land. By 2050, it is estimated that up to 700 million people will have been displaced due to issues linked to scarce land resources. As a consequence of accelerated deforestation, it will become more difficult to mitigate the effects of climate change and land degradation. By 2050, climate change is estimated to lead to a reduction of global crop yields by about 10%. Most of this will occur in India, China and sub-Saharan Africa, where land degradation could even reduce crop production by 50%. At EU level, desertification already affects 8% of the territory, particularly in Southern, Eastern and Central Europe. These regions – representing around 14 million hectares – show high sensitivity to desertification and thirteen Member States have declared themselves affected by desertification under the United Nations Convention to Combat Desertification (UNCCD) criteria. 7. Are there financial means available to achieve the objectives? There are substantial opportunities for financing land degradation neutrality projects and programmes, including from national budgets, development banks, global funds, bilateral agencies, non-governmental organizations (NGOs) and private sector. These sources of funding are steadily increasing as commitments for sustainable development continue to evolve. Effectively tapping into financing opportunities requires that countries develop and implement transformative projects and programmes backed by policies that are anchored to the principles and targets of the SDGs. In particular, the Global Environment Facility (GEF)5 resources are available to developing countries and economies in transition and serve as a financial mechanism to meet the objectives of a number of international environmental conventions and agreements. 1 United Nations Convention to Combat Desertification (UNCCD), Bonn, Germany, 2017. Orr, B.J., A.L. Cowie, V.M. Castillo Sanchez, P. Chasek, N.D. Crossman, A. Erlewein, G. Louwagie, M. Maron, G.I. Metternicht, S. Minelli, A.E. Tengberg, S. Walter, and S. Welton.